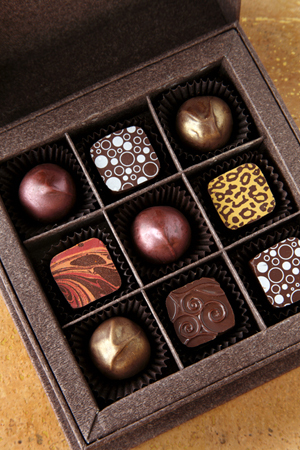 WHAT IT IS: Artisan chocolates from a California chocolatier. WHY IT’S DIFFERENT: A fashionista appeal with delicious flavors. WHERE TO BUY IT: BarloventoChocolates.com. CAPSULE REPORT: Peter Brydon used to be a pressman in the printing industry. Today he makes beautiful gourmet chocolates that should be an inspiration to anyone who’s wanted to try his or her hand at the chocolatier’s craft. In addition to a good hand, however, you also need Mr. Brydon’s fine palate and eye for beauty. This is Page 2 of a five-page review of artisan chocolatiers. See the full review below and click on the black links below to visit other pages. It used to be the case that a chocolatier had to be formally trained to be taken seriously. The idea was that if you hadn’t been to culinary school and worked in prestigious restaurants for years before setting out on your own, how could your chocolates be good? Any number of excellent chocolatiers still follow that path, but Peter Brydon is one of a new breed. Here’s a guy who was a pressman in the printing industry for 28 years before his leap into confections; his “formal training” in chocolate consists of an online course (admittedly, from a famous chocolate school) and some “international study” at a chocolatier in British Columbia. To me, this proves that anyone with the desire and the palate, regardless of background, may become a fine chocolatier. And if you open in a gourmet hotbed like Oakland, California, which Barlovento Chocolates did, you’ll have a built-in market. You’ll growl with delight at the tarragon-infused chocolate ganache. Photo by Katharine Pollak | THE NIBBLE. If I had to choose one piece out of his current collection as a favorite, I’d…well, I’d be in trouble. 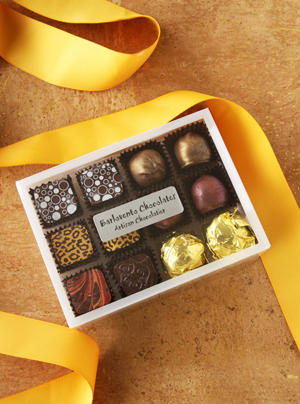 But it would probably be a toss-up between his fantastic Meyer Lemon Zest chocolate and the exquisite Kirsch Truffle. I’m a big fan of the cherry-based liqueur Kirschwasser, and in the Kirsch Truffle, it’s combined in perfect measure with dark chocolate ganache. The Meyer Lemon Zest Truffle is at least as noteworthy, though. I’ve never been a fan of lemon combined with dark chocolate; it’s always too acidic and too tart. But Meyer lemons are sweeter and less acidic, and they lend a sweet-tart grace note to a silky dark chocolate ganache (with a hint of texture from that zest). Even nicer is the fact that the Meyer lemons are from the chocolatier’s own backyard! You also don’t want to miss the Crème de Mure Truffle, with blackberry liqueur. For those who like heat, the Mayan Hot Chocolate Truffle is one of the spiciest (and excellent) chocolates. Oh, and the dark-chocolate-covered marshmallows with a cookie on the bottom—an upscale Mallomar—are a lot of fun (be sure to heat them briefly in the microwave as instructed for greatest enjoyment). 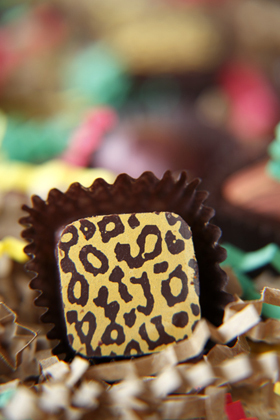 And the Espresso Truffle is a must-try…are you getting the idea here? The couverture is a single-origin cacao from El Rey. This is a sufficiently new business that online ordering is not yet available, at least at this writing, but you can call or e-mail to place an order. Editor’s Note: The website has a home-designed look, but the chocolates are extremely professional. 638 2nd Street, Monday-Wednesday and Friday, 9 a.m. to 4 p.m.
Make someone happy with a box of these pretty artisan chocolates. Photo by Katharine Pollak | THE NIBBLE.